ARLINGTON, VA – (November 3, 2015) – Hobsons, the world’s leader in college and career readiness, admissions, and student success, today announced the launch of a new digital course designed to help high school students develop critical skills necessary for entry-level jobs, and prepare for the ACT WorkKeys®. As the number of U.S. high school graduates pursuing postsecondary education declines, the U.S. Bureau of Labor Statistics reports that many high school graduates are now moving directly into the workforce, either instead of going to college or as a means to save up for their postsecondary education. Every year, millions of students take the ACT WorkKeys® career-readiness assessment, which is used by thousands of employers to determine if potential hires have the skills necessary to succeed. Students who complete the assessment are also eligible to earn a National Career Readiness Certification (NCRC). The Naviance Test Prep WorkKeys® course is integrated into the Naviance platform, which enables students to access all of their college and career planning resources in one place. Through the platform, school counselors and administrators can also report on the progress of college readiness efforts and deliver individualized guidance and instruction to each student. 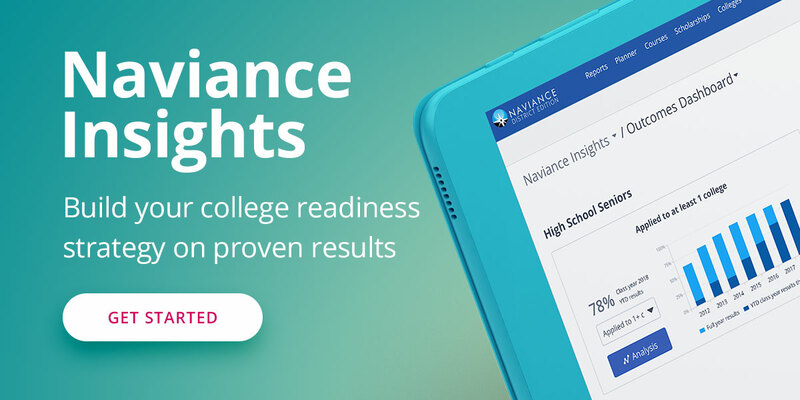 Naviance is used by more than 7 million students, including in 27 major urban districts like Houston, Philadelphia, Indianapolis, and Broward County, Florida. The WorkKeys® course is a game-based test prep course that includes lessons, practice questions, and two full-length tests to help students prepare for their immediate future after high school. The course specifically helps students develop skills in subjects such as applied mathematics, reading for information, and locating information, which are the three measures tested for the NCRC.